BitMargin.org Review – Another Crypto Ponzi SCAM! BitMargin.org is yet another cryptocurrency investment-based Ponzi Sheme, which pitches its “investment plans” through a website that throws up all types of red flags for those the slightest bit versed in this shady vertical. Many things do not add up about this operation, from the fact that they hide their actual “products” behind a registration, to the too-good-to-be-true promises they make and the lack of information concerning the people behind it all. Bitmargin.org claims to be the provider of a unique platform for cryptocurrency (Bitcoin) investment. Look no further: those who know this industry, already know from this that there is a 90% chance this is indeed a scam. Unfortunately, the remaining 10% doubt dissipates quickly too, as one digs deeper. Sure, there’s a lot of nonsense spewed on the Bitmargin homepage about how the platform is a cutting edge one, and how Bitmargin is in fact the best destination for your bitcoins, but the truth is that none of it is the least bit convincing. As a matter of fact, the more one reads into the homepage copy, the more obvious it becomes that this cannot possibly be anything else but a Ponzi scheme, aimed at relieving you of your bitcoins. Among other things, we learn that the site employs a team of “professional traders” who know their trade so well, they can earn their victims investors some rather outlandish profits, while – presumably – generating some revenue for themselves too on the side. Starting an investment with Bitmargin is literally as simple as 1-2-3. One has to register an account, studying the investment plans afterwards. Making a deposit and losing it all starting to invest is the next step. It has to be noted that you will not be able to study the said plans before registering your account and giving the scammers your personal information. No, you cannot. By the looks of things, this operation is indeed a Bitcoin-based Ponzi scheme. In order to access information regarding the various investment plans on offer, you have to create an account at the site. Don’t do it. We’ve done it for you and will provide all the relevant bits below. They’re every bit as unimpressive as you’d expect them to be. With Plan B, the total return rate is 120%, which makes a bit more sense. Every 6 days, investors get a 20% return. The minimum deposit on this deal is 0.04 BTC as well, while the maximum is 5 bitcoins. Plan C offers 100% monthly returns, and that’s right: this revenue stream is set to last forever too. The minimum deposit for this account is 0.1 bitcoins, while the maximum is 10 bitcoins. Where to begin? Pretty much everything about this operation is a red flag. The fact that their actual “plans” are hidden behind a registration page, the too-good-to-be-true deals, the lame promises on the homepage, as well as the existence of the 10% affiliate commission program, which is obviously meant to keep pumping new money into the Ponzi scheme that this operation most definitely is. The About Us page offers no information on the perpetrators of this scam, the Testimonials are all hilariously fake. Everything is indeed rotten in Bitmargin-land. 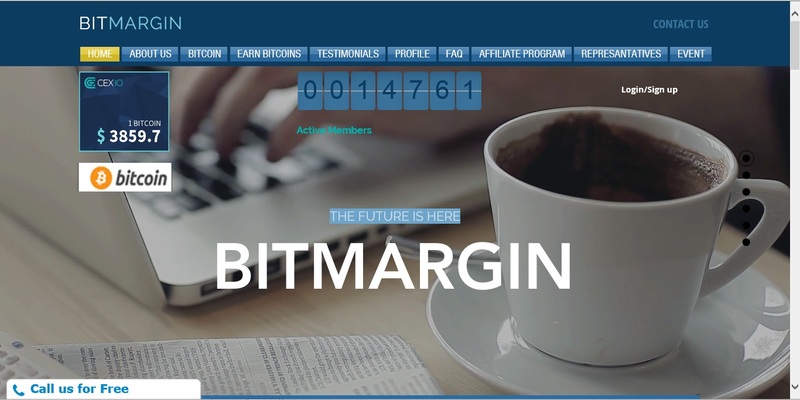 Bitmargin’s creators have obviously gone to great length to create the appearance of a happy community of users. They have set up pages offering positive feedback here and there, though the truth has indeed surfaced already, as real users have chimed in on the “service” through various forums. Such feedback is always about how Bitmargin is a Ponzi scheme and how no one should invest his/her bitcoins with them. According to SimilarWeb, BitMargin.org was not at all popular. The site had a global rank of 10,696,613 when this review was posted on November 12, 2017. Much of its visitors seemed to be from South Africa, where this site was ranked 236,630. Bitmargin fits the Bitcoin-investing scam mold to a T. Keep your bitcoins and do not give these Ponzi schemers yet another reason to exist. Review Verdict: BitMargin is a SCAM! Do you have any first-hand experience or information pertaining to BitMargin? Please share it with us by leaving a comment below. Thanks for reading our BitMargin review. For legit alternatives, feel free to visit our Cryptocurrency Day Trading Center. We invite you to subscribe to ScamBitcoin.com to receive all our reviews directly to your e-mailbox.